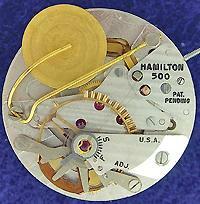 The Hamilton Electric Watch was a pioneering invention,but it must be remembered that it is now an antique which cannot be expected to perform as accurately as a modern quartz watch. It is mechanically delicate and should be treated as a fine piece of jewelry. IT IS STRONGLY ADVISED THAT THE WATCH BE SHUT OFF WHEN NOT BEING WORN. To turn off the watch, simply pull out the setting stem. This will prevent unnecessary wear on the fragile contact surfaces, adding years to its operable lifetime. 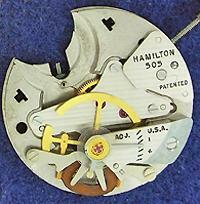 If it does not start when the stem is pushed in, gently rotate the watch to set the balance wheel in motion. You can damage your watch or break the battery clamp if you attempt to install an incorrect battery. For the Model 500 and 500A movements use the Eveready 387S (note: if you replace the battery yourself, exercise extreme caution to avoid touching the exposed contact wires in the Model 500 or 500A). Originally the Model 505 used a number 301 or SR43SW battery. However, in recent years all of the major manufacturers have changed the dimensions of their 301 batteries. These new versions of the 301 are too thick and will short out in a 505 movement. They also put too much pressure on the battery clamp and can cause it to break. Consequently 301 or SR43SW batteries should NOT be used anymore! This is extremely important. The best option today is to use the same 387S recommended for the Model 500. Although the lifespan will be slightly less than the old 301 batteries, it has the correct voltage, fits perfectly, and will not damage the watch. (It may be necessary to raise the prong of the cell lead on the underside of the battery very slightly to ensure good contact). Batteries should be installed with the positive pole up.